The image of the groom flying in the air at his Roma's Hospitality Centre Wedding is a dynamic and fun one. The boys enjoyed so much the shot that I decided to incorporate it in every single wedding that has a large enough bridal party. 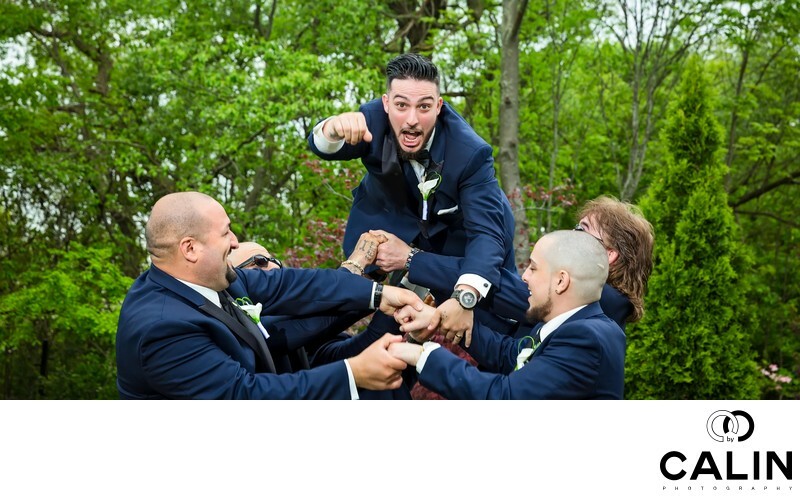 To create this shot I asked the seven groomsmen to pick up the groom and throw him in the air. In the meantime he assumed the Superman's pose and started screaming. Words cannot describe the enthusiasm of the groomsmen who gladly embrace the opportunity to have fun. I illuminated this image using a Profoto B1 strobe. To capture this photograph, I used a Canon 24 to 70mm lens shot at F7.1 and1/200s shutter speed. In post production I enhance the colours, adjusted the exposure and applied a slight vignette to make the subject of this photograph, the groom, stand out. A few elements make this a striking image: first the groom's expression is priceless. Second, the sense of motion makes the picture send out. Third, the image quality is outstanding. The focus point is on groom's eyes in the image is very clear. Fourth, the lighting is exquisite, the Profoto strobe creating a beautiful quality of light. Finally, the post processing adds even more value to this candid wedding photo. This image was processed both in Lightroom and Photoshop. First, I adjusted the colour then increased the sharpness, the vibrancy of the images and added a vignette to draw the viewer's attention to the subject of the image, the groom.